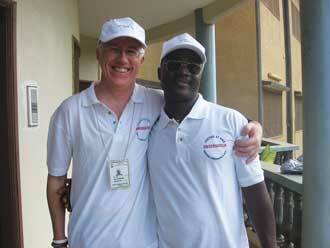 Dan Lafrenière and his driver/guide Parfait at CENJP offices, Lomé, Togo. Hot and dusty is an apt description of the bustling metropolis of Lomé, the parched capital of Togo on West Africa’s Atlantic coast. In late February, I found myself stepping off the plane, onto the sizzling runway tarmac and into the hot tropical night, about to embark on a new African adventure that would make me a part of an experiment in politics and democracy. I was a long way from the calm and sedate duties as an administrator for the Department of MedIT of the Faculty of Medicine. I had been invited back to Lomé as an international election observer, part of a 3,000-strong delegation set to monitor the presidential elections of the Republic of Togo, a small, linear country about the size of New Brunswick, with a population of just over 6 million people. I had come at the request of the Commission Épiscopale National de Justice et Paix (CENJP), a country-wide network of animators and volunteers who educate the Togolese people on human rights, including their voting rights. I was one of two volunteers from Canada and long-time members of Development and Peace (D&P), the official international aid agency of the Catholic Church. For the next week and a half, we criss-crossed Lomé, a city of more than 800,000, attending rallies for various political parties, speaking to interested voters, partisans and other observers and comparing notes about the election scheduled for March 4. In the two hours we surveyed a lively rally of the Union des Forces pour la Change (UFC), we could feel the excitement that defined the main opposition party in Togo, eager for change and a chance to move the country in a positive direction. Ben, one of the organizers of this event told me he was very hopeful for the UFC’s chances at upsetting the governing party RPT (Rassemblement du Peuple Togolais) and end a monopoly on power it has held since 1967. Taking a cue from the Obama campaign, Ben proudly proclaimed that il faut que ça change! I tried very hard not to get caught up in the euphoria and reminded myself that my mandate as an observer was first and foremost to be impartial. I was to monitor the vote in Atakpamé some 160 kilometres north of Lomé and the centre of violence that tainted the last presidential election in 2005. I was a little apprehensive this destination considering that in the former contest more than 500 rioters were killed (mostly by police) and some 40,000 people fled the violence into neighbouring Benin and Ghana. Voting Day was surprisingly calm, uneventful and hot. We managed to visit more than 15 polling stations in and around Atakpamé and saw no irregularities. There were no reports of violence and voting appeared to be fair and transparent. What we did not anticipate was the government’s deliberate delay in releasing results that were available only a few hours after the polls closed at 5 p.m. And the supposedly non-partisan CENI did not release the provisional election results until late in the afternoon on our very last day in Togo, a day after both the opposition UFC as well as the governing RPT claimed victory. The CENI claimed that the ruling party RPT had indeed secured victory with about 61 per cent of the vote versus 39 per cent for main rival UFC. [Ed. note: The RPT’s Faure Gnassingbe was sworn in for a second five-year term as Togo’s president on May 3]. None of the observation team members were happy to leave the country or “abandon” our partners amid a cloud of political uncertainty and it was only upon our safe return to Europe and Canada that we learned of the rioting and pitched battles between demonstrators and police that might have compromised our security had we stayed behind for even an extra day.